Greenville’s Noah Walker tries to get around a Fairborn defender during their Greater Western Ohio Conference game on Friday night. The Skyhawks won the game, 83-30. Greenville’s Nolan Curtis floats up a shot toward the basket during a Greater Western Ohio Conference game at Fairborn on Friday night. The Skyhawks won the game, 83-30. Greenville’s Tyler Beyke tries to get around a Fairborn defender during their Greater Western Ohio Conference game on Friday night. The Skyhawks won the game, 83-30. 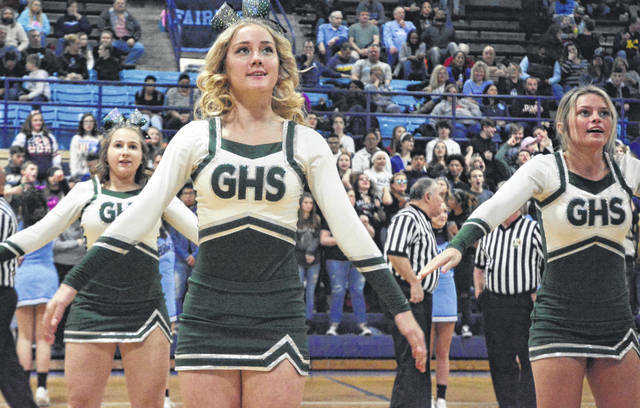 The Greenville varsity cheerleaders performed during a break in the action of the Wave’s Greater Western Ohio Conference game at Fairborn on Friday night. The Skyhawks won the game, 83-30. 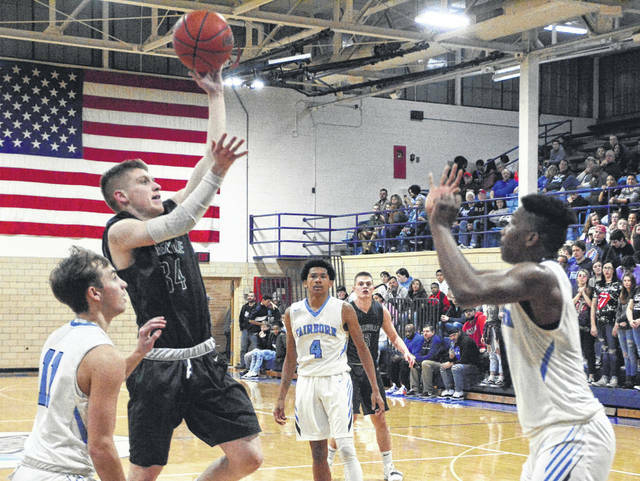 Greenville’s Noah Walker shoots a 3-pointers from the corner during a Greater Western Ohio Conference game against Fairborn on Friday night. The Skyhawks won the game, 83-30. 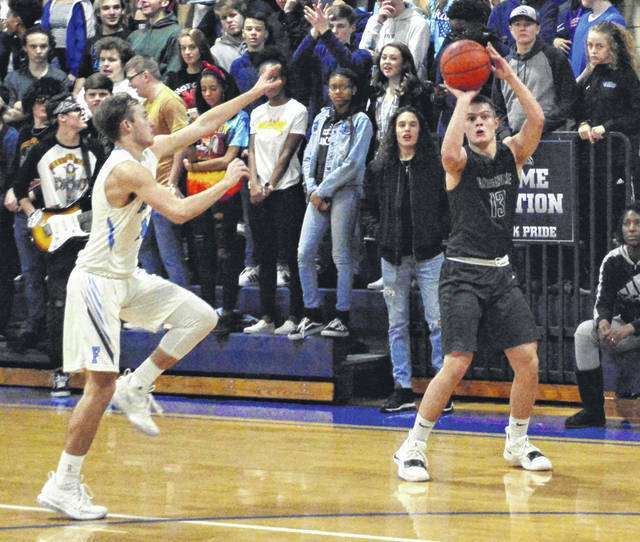 FAIRBORN – In the second half of the season, the Greenville offense had been showing signs of life scoring 61, 48, 71 and then 66 points in its games since winter break – an average of more than 61 points per game. This was giving the Wave hope that they could continue this momentum against Fairborn. However, Fairborn’s taller and more athletic lineup wore down Greenville, who struggled to score on this night falling 83-30. 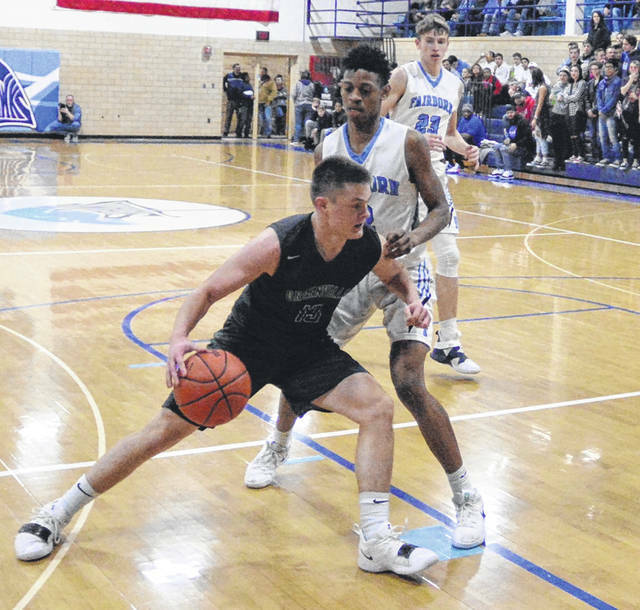 Fairborn used a half-court trap almost the entire night, then even while running their conventional defense, the Skyhawks would spring a trap on Greenville. Turnovers were a problem all night as Greenville struggled to adjust. The team did hit some free throws early on, but would not score a goal from the field until late in the first quarter when Tyler Beyke landed a shot. It was 21-5 at the first break, but the search for offense would continue throughout the game. Greenville played a man-to-man defense and Fairborn used a 4-1 offense that used a lot of cutting to the basket. With their taller lineup the Skyhawks would find a lot of second chance shots., and with a deeper bench, they could rotate players in freely. 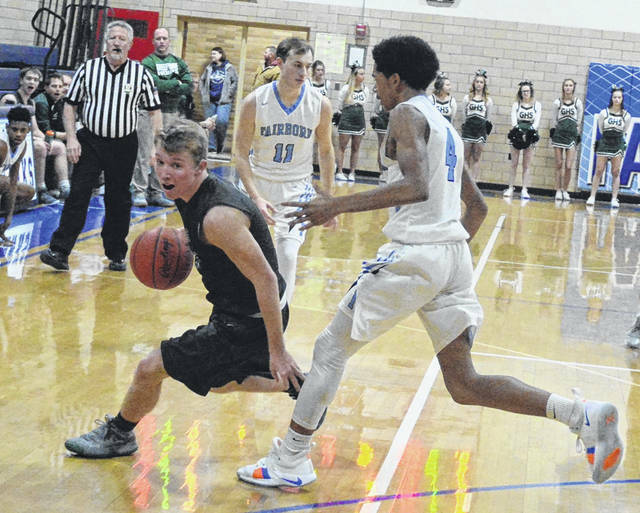 Greenville briefly used a half-court trap in the third quarter, more to try and force a few turnovers before going back to a man defense, but Fairborn could score equally well inside and outside making it hard for the Wave to stop their offensive weapons. The Greenville coach was asked about the game and about Noah Walker, who lead scoring for Greenville. “Fairborn is 8-1 in the league. They are a very tough team,” Greenville coach Kyle Joseph said. “They have the personnel where they can win the GWOC. We tried to put some stuff together that we had worked on, but turnovers have been a problem this year and it got us again. When we did get shots and had first shots misses, we weren’t there to rebound. But giving the ball up so easily made us lose control, and we messed up on both sides of the ball as we lost our confidence. All in all, it was a frustrating night for winless Greenville. They do have most of their games at home in the last of the season and if they can get their offense back on track, they play teams that they can surprise. Scoring for Greenville: Reed Hanes 6, Tyler Beyke 2, Noah Walker 11, Jordan Dill 4, Foster Cole 4, Nolan Curtis 3.